If your garage is a disaster area, getting organized can seem like a monumental undertaking. A quick way to make some progress is by getting your tools up off the garage floor – especially your garden tools. I chose to use the Gladiator GearTrack, which is one of the more popular garage track systems, but there are several different brands to choose from. See why I recommended Gladiator and everything else I considered here. 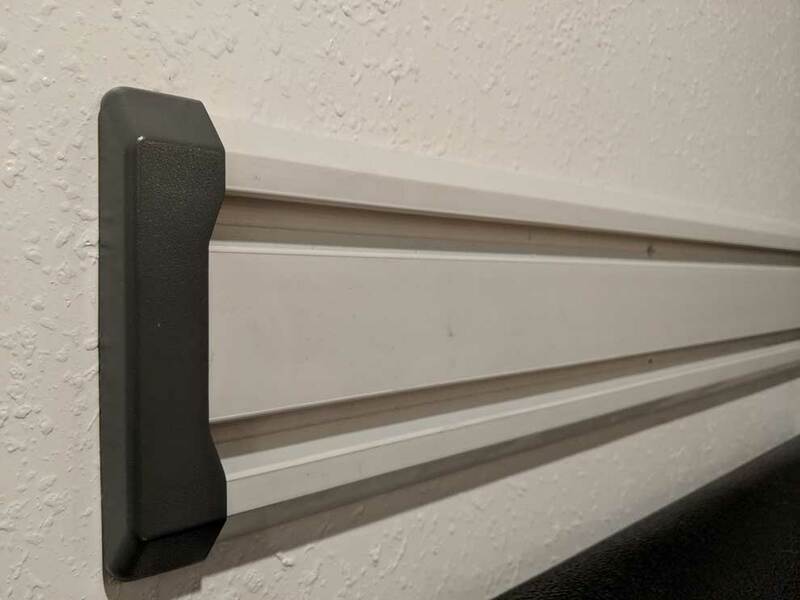 In this article, I’m going to walk you through how to install a garage track system to either drywall (recommended) or concrete block (if you must). The premise will work with most brands, but be sure to check with the manufacturer to see if there are any quirks with the system you’re looking at buying. Let’s tackle the easy one first. 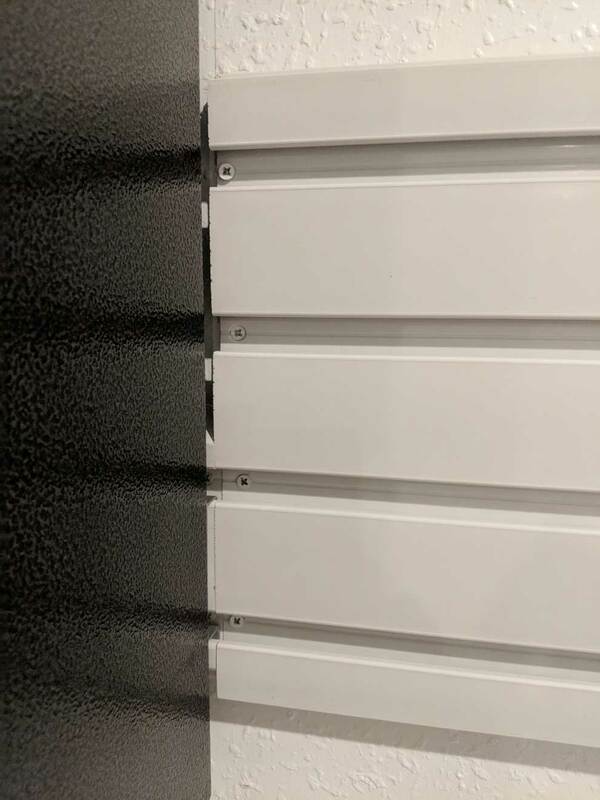 No matter what brand you choose, you’ll need to install a garage track system to your wall studs. Never use drywall anchors! They won’t be able to support the amount of weight of everything you’re going to hang on the wall. You’ll want to make sure that the track pieces will fit where you want them to go. In my case, I was about four inches short of being able to use a full 8′ section of GearWall. I had a choice to make. I could either cut each piece down to fit or I could slide everything up the wall by four inches. If you’ve got the ability to shift things around to use a full section of track and still have it look good and fit your needs, I recommend that. In my case, I had to slide my cabinets farther up the wall than I’d intended, but it still looks good. Since I was doing this myself, I macgyvered a solution using a box sitting on top of my garbage can to get everything into place. That way I had both hands free to secure the track. Using a stud finder, locate where the studs are in the wall. If you’re a new homeowner or just not very handy like I used to be, I’ll give you a tip. You’re actually looking for the center of the stud, but most stud finders will only tell you where the edge is. To find the center, you’ll need to come at it from both sides (left and right). What I do is slowly sweep in from the right hand side until the stud finder has located the edge of the stud. Mark this with a small vertical line. Then, do the same thing but come in from the left hand side. Once the stud finder locates that edge, make another small vertical line. In the center of the two lines, make a small ‘x’. This is the center of the stud and where you’ll want to attach the track. 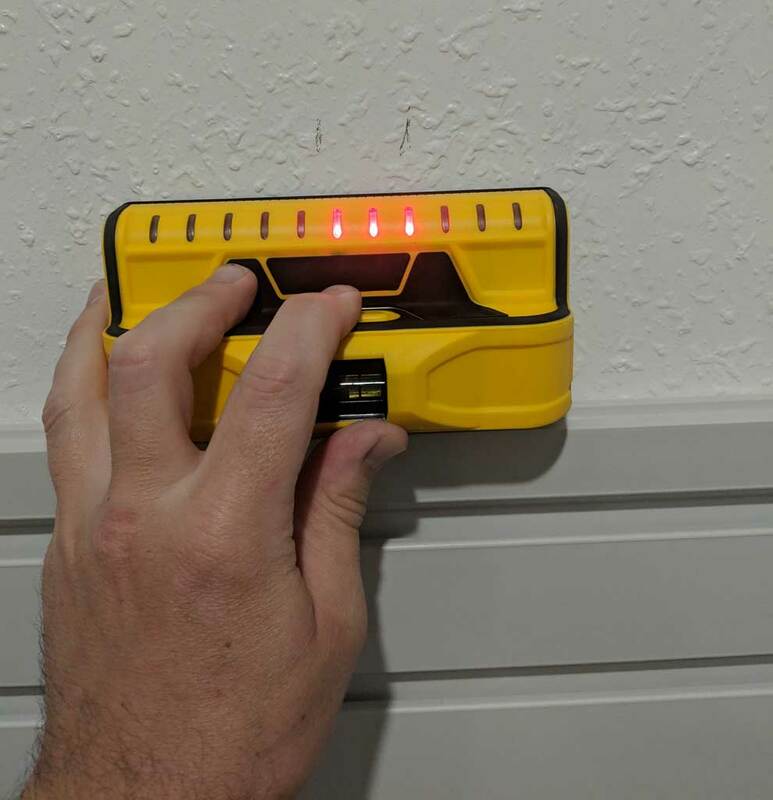 Or…I found a really awesome stud finder that has multiple LED lights that show exactly where the stud is as you’re moving along the wall. It takes a lot of the guess work out of it. This model is the Franklin 710+, and runs for about $50 at Lowe’s. It’s a little more money, but I think it’s worth it. Oddly enough, the 2×4 boards that are used for the studs are slightly less than two inches wide. This is because the machining process smooths off a little bit of the edges to make a smooth surface. Important: Be sure to locate any electrical outlets or wires that are behind the drywall. Drilling or screwing into a live wire can be a shocking experience. In a perfect world, you’ll position your garage track system so that you can screw it into as many wall studs as possible. In a perfect world, with a 48-inch piece of track, you can cover 4 studs if your studs are 12″ apart or 3 studs if they are 16″ apart. But it’s never a perfect world, so don’t get too hung up on that. Just try to attach the track system to as many studs as possible with a minimum of two. As a general rule, the more stuff you’re going to hang on the track, the more secure it needs to be. Place a screw at the bottom of each channel (see image below). For GearTrack you’ll need two screws per stud. For GearWall, like I have below, you’ll use four. It’s worth repeating, you want to have as many screw attachments as possible – ideally three or four per four foot track. If you can’t attach your track system to at least three studs, you may want to rethink the location. Once you’ve got the track placed and the first screw into the wall, you want to make sure it’s level. I don’t know about you, but I’m that person that can instantly tell when things are crooked. Picture frames, mirrors, you name it. I can tell from across the room if it’s off by a centimeter and it bugs the crap out of me. So after you’ve got the first screw in the wall, break out your level and make sure that everything is on the up and up. That way if you’ve got an annoying friend like me that will point out when things are crooked, you won’t give them anything to complain about. Fit the endcaps and start adding the accessory hooks. This is the fun part where you start to take pride in your garage. Plus, you can show your neighbors how cool your garage storage setup is. It’s a bit more complicated to install a garage track system to a concrete block wall. There’s a right way to do it and a wrong way. Of course, I did it the wrong way the first time. 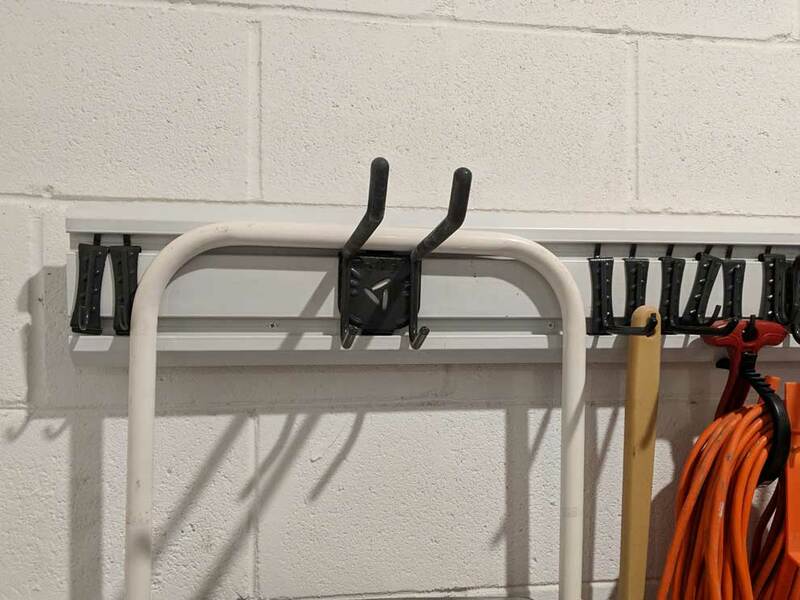 Because the concrete block wall doesn’t have studs, it’s less secure to install a garage track system to concrete than if it was screwed directly into the studs. Concrete is porous, which means that it absorbs water. Over time any water that seeps into the concrete block can erode the block around the screw, weakening it. Water can even start to corrode the screw itself and eventually cause it to fail. 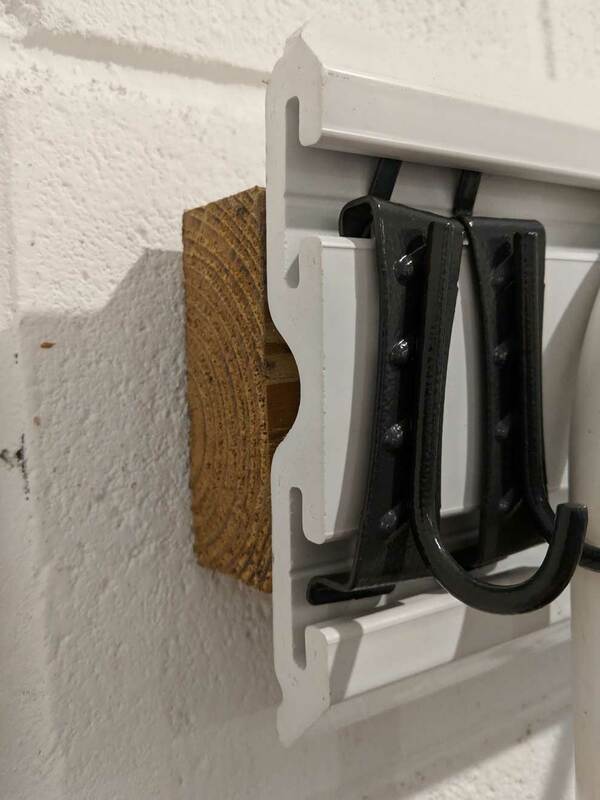 That’s why Gladiator recommends that you install vertical wooden studs into the concrete block and mount the GearWall system directly to the studs. Rubbermaid goes a step further. They only recommend mounting the FastTrack rail system to wooden studs. Nothing else. Not saying it can’t be done, but it’s not recommended. The mounting studs need to be vertical to get the maximum weight capacity for your garage track system. That was my mistake. 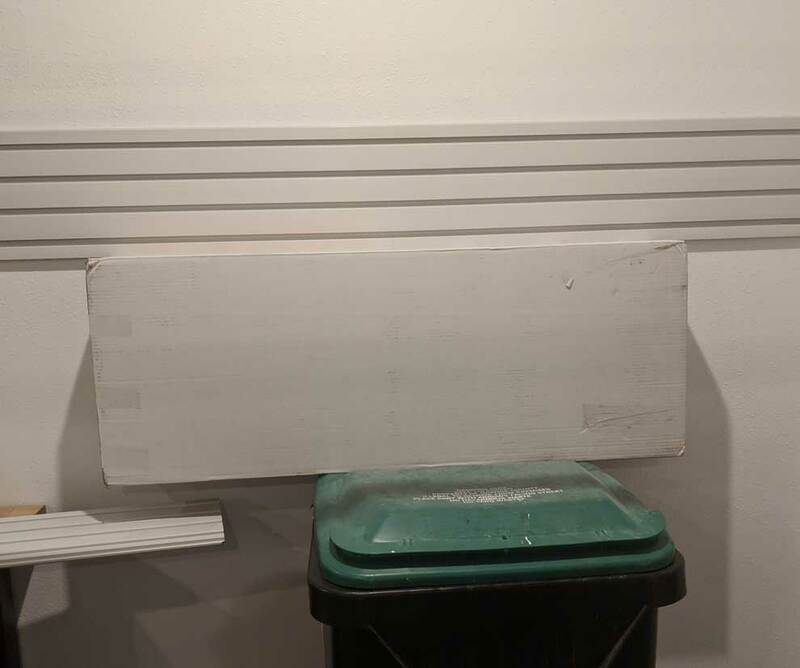 I mounted a single 8 foot 2×4 horizontally, right underneath my track. Within a few weeks of putting my garden tools on it, I started to see the track bending at an angle underneath the weight. And I wasn’t anywhere near the recommended weight capacity of the track. The more weight you add to the track system, the more the track is going to be pulled away from the wall. Tools, lawn equipment and ladders are heavy, so you need to make sure that the track is supported properly. Wall studs are nothing more than 2×4 or 2×6 boards that are cut to whatever length you need. Ideally, the stud would go all the way from the floor to the ceiling to give you maximum support. Of course, ideally, the studs would be part of the frame, but then you’d be reading the other section instead. I recommend at least a three foot vertical stud to get the full weight capacity of the track system. Before you start drilling holes, this is also a good time to think about waterproofing your garage walls for some extra protection. First, pick a location that is roughly the center of a concrete block, but away from any of the joint lines. You’ll want to avoid screwing into the mortar. It’s not as solid as the block itself, so the connection won’t be as strong. I use Tapcon concrete screws, but you can use another brand if you prefer. I try to put screws every 12-16 inches along the stud in order to keep it snug against the wall. Once the first screw is in place, make sure that the stud is level before going any further. Nothing is worse than having crooked stuff on your walls. We’re making your garage someplace neat and organized. Someplace that you can be proud of. Take the extra time here and make sure it’s right. Put additional studs every 12″ or 16″ along the area that you’re going to mount your garage track system. Exactly how far apart is up to you, but once you make a decision…stick with it. By spacing the studs every 12″ to 16″ apart, you’re allowing for several connection points along the track rail. More connection points = a stronger attachment to the wall = higher weight capacity. Don’t put that level away yet. You’re still going to need it. Space out the track rail so that it overlaps as many studs as possible. I’ll say it again, the more attachment points you have, the stronger the attachment will be. Ideally, you’ll want at least three screws in a 48″ track, so try to plan accordingly. Gladiator recommends that you put screws at the bottom of each channel, for the GarageWorks GearTrack. Never screw into the center of the channel. Since the two channels are what actually makes contact with the wooden stud, there will be a small gap in between the stud and the center of the track. If you put she mounting screw in the center, it won’t have as secure a connection. Before you screw in the second screw, take a few seconds to make sure the garage track is level. Nothing is worse than having spending a lot of time permanently attaching something to your house and then realizing that it’s crooked. Trust me, once you notice it, you can’t unsee it. Measure twice, cut (or drill) once. Once you’re finished mounting the garage tracks, it’s time for the fun part. Add an endcap to each side so stop any dust, debris or spiders from getting in there. Then start mounting the accessory hooks, baskets, or whatever else you can imagine. Getting more organized in your garage isn’t hard, and it’s pretty affordable too. You can install a garage track system to take back your floor space and start transforming your garage into something really amazing. Do you have a cool setup that you’d like to share? Let me know in the comments below.